Easily and quickly send files and folders to multiple destinations across your LAN by simply dragging files onto recipients in a popup window. The easiest way to get things from one place to another quickly without dialogs, passwords or confirmations. DropCopy is FREE for personal use (up to 3 machines on a network) and $25 for larger networks but donations are always welcome. 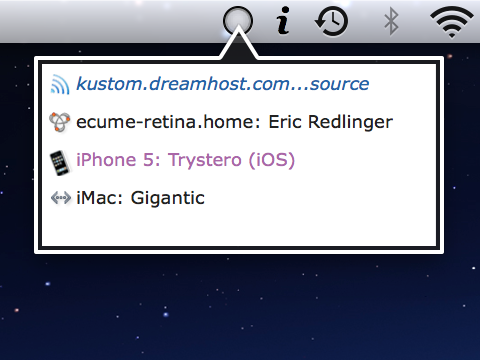 …or drag right to the menu bar icon! DropCopy can be used in a few different scenarios. •Individuals with 1-3 devices: simply download the free version from either the App Store or via the download link below. •Individuals or households with 3-10 devices: purchase the Pro version from the App Store, which is tied to an Apple ID. Every machine that is linked with that Apple ID can download the pro version for no extra cost. •Large households or small businesses: a site license will cover an unlimited number of simultaneous devices. Note that a site license can not be purchased or applied via the App Store, but rather via the this link. Want to get the most out of DropCopy? Check out the DropCopy Tips and DropCopy FAQ pages for lots of helpful solutions and tips.